It's been ages since I posted any news on here but that doesn't mean I haven't been busy! 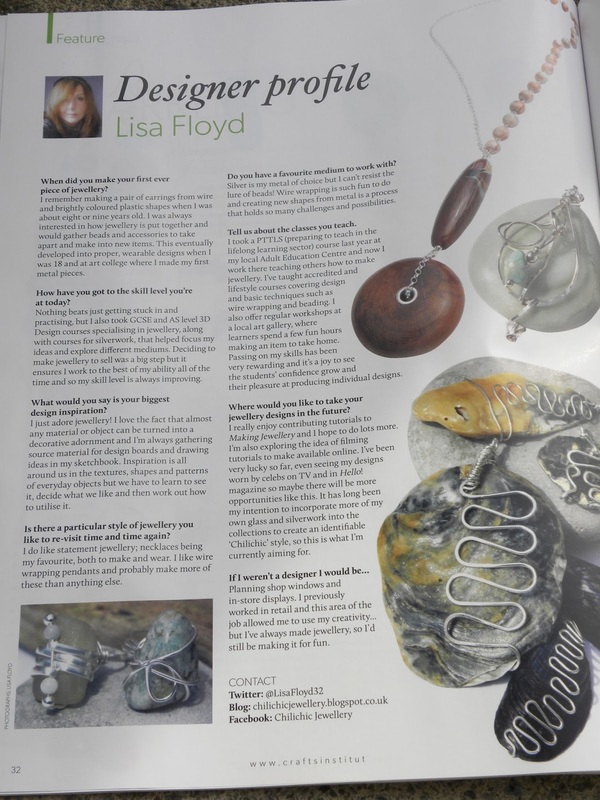 Back in September, I was delighted to be asked to contribute to issue 57 for Making Jewellery magazine , this time for a designer profile. Jewellery really is my passion and it was nice to reminisce about where my enthusiasm for making my own pieces started. For me, my love affair with sparkly adornments really did start when I was a young child and I think was fuelled by having two older sisters who could wear pierced earrings! I wanted my ears pierced so bad when I was 7 years old. I'd spotted a pair of fan earrings on a stall at the open air market and had become obsessed...they actually opened and shut... "how fantastic" I thought, but they couldn't be mine, I had to make do with a pair of old fashioned clip-on cameo studs...oh the shame!! Well I nagged my Mum and after promising faithfully to be responsible for looking after my ears (the smell of TCP takes me right back), I was allowed to have gold studs rammed through my ear lobes on my eighth birthday. And the fan earrings became mine. Of course it wasn't long before I became bored of them and took them apart, one to be transformed into a necklace pendant and the other an accessory for my Sindy dolls. 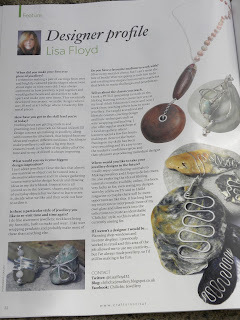 I'd already started making my own jewellery pieces by the age of 8 or 9 and was fascinated by how elaborate pieces were created and set out to see what I could do. My sister helped me make earrings with wire and neon bright coloured plastic shapes that were pretty ugly I'm sure, but I thought beautiful. I progressed to collecting old jewellery and breaking it up to make new things. Although I've (hopefully!) improved my skills over the years, I still love re-purposing old accessories and am loving the latest 'up-cycling' trend. Up-cycling is a much better word than re-cycling when it comes to jewellery, It's all about giving things a new lease of life, a new interpretation. There are some fantastic examples online (check out this fab site - Helen Makes Things) and I wholly recommend anyone who fancies giving jewellery making a go, starts with a bit of up-cycling. We started our new LIFESTYLE class at Bedwas Adult Education Centre a few weeks ago and I welcomed four new students and one returner. I've set them an on-going task to create an up-cycled design of their choice. We also looked at how to create a Vintage effect and this style can be incorporated into their chosen item. Making a design using old parts or found objects is more challenging than using all new and I hope will give the learners a chance to apply their new, basic skills and meet problem solving head on. I'm interested to see the colour options they go for and how they mix the new components and findings with the old. I trawled the charity shops myself recently for some inspiration and will be tackling my own examples as we go along. Here are a few ideas and some quick results. Chain, beads, buttons, ring and locket all up-cycled from old items. These rings were great fun to make, simply use old earring parts, cut off stud backs and glue onto ring blanks with epoxy resin glue.